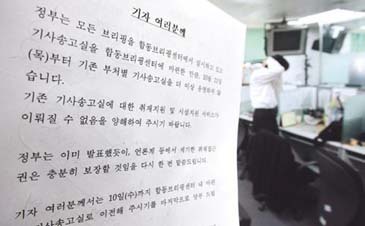 S. Korean government announces that it will close all the pressrooms of each ministry as of Oct. 11, 2007. The South Korean government on Oct. 11, 2007 cut off all Internet access to the current pressrooms in government buildings to force unwilling journalists in the nation's capital to move into a new press center as part of its plan to greatly reduce the number of pressrooms, a local newswire Yonhap News reported. The move follows an earlier ultimatum by the Government Information Agency asking correspondents at each government ministry to vacate their work stations by Oct.11 or face a forced shutdown. The information agency, spearheading what it called far-fetching press reform, has built a new, integrated press center at the Foreign Ministry building for all journalists attached to government ministries in Seoul. The journalists refused to move into the new press center, claiming that working out of ministry buildings would undermine their ability to serve as the eyes of their readers. "Without journalists being on the lookout, how will the public know when the government is doing something wrong because the government will only say good things about itself," a newspaper correspondent at the Foreign Ministry said, asking not to be identified. At the center of the tension between journalists and the government is the government's plan to limit journalists' access to government officials without authorization. The plan, journalists believe, would prevent whistle-blowers while allowing the government to monopolize information. The so-called "plan to advance journalism" began when President Roh Moo-hyun accused journalists of forming a kind of cartel against the government and of intentionally writing only negative stories about his administration. The presidential office, Cheong Wa Dae, however, has decided to leave its pressroom intact, saying the correspondents covering the office are handling vital information that needs to be immediately released to the public.